In 3 1/2- to 4-quart slow cooker, combine beef, mushrooms, onion, bouillon, pepper and nutmeg; mix well. About 15 minutes before serving, in small bowl, blend sour cream and flour until smooth. Add 1/3 cup hot liquid from slow cooker; mix well. Stir flour mixture into beef mixture. Cover; cook on low setting an additional 10 minutes or until thickened. Carefully open warm pita bread halves. 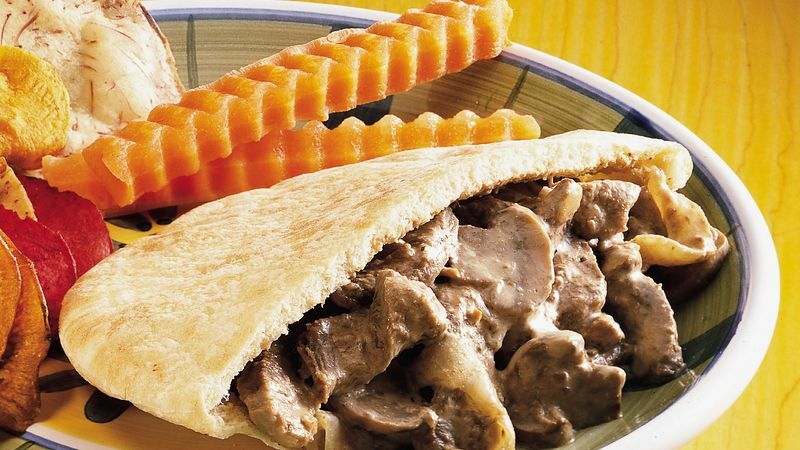 Spoon about 3/4 cup beef mixture into each pita half. Try serving this beef mixture over baked potatoes rather than using it as a sandwich filling. Or spoon it over hot cooked noodles or rice.